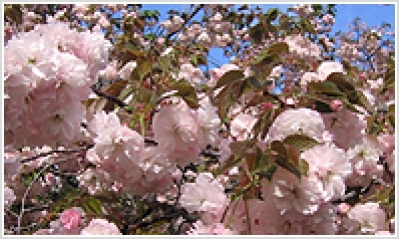 The flower is similar to Omura Cherry Trees in terms of the petals and sepals, and the double-flowered characteristic. The stamen in the center turns into two leaves, which at the same time function as sepals. Usually there are 5 sepals and 36 petals, 56 at most (avarage is 45). The color is a light pink in buds, and beige pink in full bloom. The size of the flower is 4.5cm in diameter, a little bigger than Omura Cherry. The beauty of the flower is phenomenal.